Your Gold Hill Redwood furniture arrives ready to use. 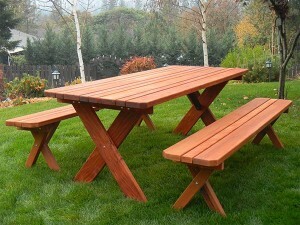 Before shipment, each piece is treated with a water based, environmentally friendly, semi-transparent, redwood stain. 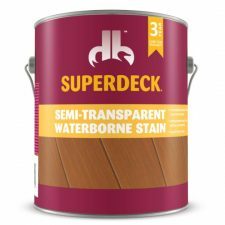 The product we use is made by Superdeck Products, one of the recognized leaders in wood and outdoor finishes. Redwood gives you legendary durability that holds up to the elements with natural beauty. Redwood won’t stain like composites and plastics so you don’t have to worry about barbecue grease or red wine. You can let your redwood age gracefully, taking on a distinct gray-weathered look over time or, to keep the wood supple and the color bright, choose to apply a sealer. To clean, simply wet it with a hose and wipe it down with a rag and a bucket of plain water (no soap), then let air dry. Do not powerwash. For a long-lasting, warm red appearance, your may choose an annual application of a quality redwood sealer. We recommend the same Superdeck Semi-Transparent Waterborne Stain we used originally. This semi transparent stain accentuates the character of the wood and refreshes the familiar redwood color. It is widely available at hardware stores and online. Redwood’s unique cell structure lets it hold a finish better than other woods, so simply refinishing your redwood every year or two will assure years of service and protection from the elements and make your redwood furniture look its best and last even longer. Redwood gives you years of care-free performance with heartwood that is distinctively elegant and naturally resistant to insects and decay. Year after year, redwood beauty endures.